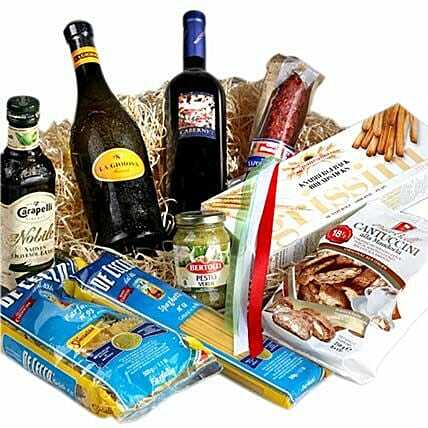 A wonderful hamper with 1 bottle of Prosecco 0,75l La Giogiosa, 1 bottle of italian red wine 0,75l Cabernet, 1 glass of native carapelli olive oil 0,5l, 1 glass of Pesto 185g, 1 package of spaghetti 500g, 1 package of farfalle 500g, 1 package of grissini 125g, 1 package of Cantuccini 250g, 1 Salami Napoli 180g. The delivery takes place in a break-proof box. Due to the protection of minors, we only sell alcohol to person over the age of 18. Store the wine in the refrigerator. Please refer to the expiration date on the bottle and consume your wine before that. Upon receiving the edibles, immediately refrigerate them.